e) be able to pay the full amount for the counter, which may include additional costs for taking cubes from one of the Demand tracks. There are two types of cards, Location cards and Industry cards. Location card allows you to build at that location. An Industry card allows you to build that type of industry BUT only in locations that you are connected to. In the Canal Period you can build in any location that you are connected to by your own canal links. In the Rail Period you can build in any location that you are connected to by your own rail links or where you already have an Industry counter. If you play an Industry card as your very first 'build' card then you can build in any space that matches the symbol on the card. IMPORTANT: There is a 'virtual' connection between Liverpool and Birkenhead which acts in the same way as an owned canal/rail link. It cannot be used to move coal along or sell cotton. Each location is made up of a number of spaces. Each space contains one or two industry symbols. In all cases the counter you build must match one of the symbols in the space that you build in. If the Industry counter you wish to build has a black cube marked on it then you must be able to move one coal cube to the location that you intend to build in. There are two sources of coal; coal mines and the Coal Demand track. You must always take a cube from a coal mine in Lancashire if possible, which can belong to any player. If there are no coal cubes that you can legally take in Lancashire then you can take one from the Coal Demand track. There are two reasons why you could not take coal from Lancashire; you may not be connected to a source by canal/rail links, or there may be no coal left in any locations in Lancashire. If you can take coal from Lancashire then you must take it from the closest source, the distance being counted in constructed canal/rail links to each potential source. In the case of equidistant sources you choose which you wish to take. Coal must be moved along constructed canal/rail links to the location where you intend to build. You can move coal through an External Location. Once you have moved it to its final destination you remove it and place it back in the stock. If it is not possible for you to take coal from Lancashire then you can take it from the Coal Demand track. To do so the space that you are building in must be connected to a constructed port by canal/rail links. You must pay an extra amount for this cube, as shown on the Demand Track. If there are no cubes left on the Coal Demand track then you can take one from the stock at a cost of £5. This is considered the same as taking it from the Coal Demand track. If you take the last cube from a coal mine then you flip that counter to its other side. The owner of the mine immediately moves his income marker a number of spaces along the Income Track equal to the value shown in the gold circle. You never have to pay another player if you take coal from their mine. You can move coal along anybodies canal/rail links. You do not pay anything to move coal, even if it is along another player's link. If the Industry counter you wish to build has an orange cube on it then you must take one iron cube from somewhere. If possible you must first take it from an iron works in Lancashire, which may belong to another player. You do not need to be connected to the source by canal/rail links. You do not need to take it from the closest source. If there are no cubes in Lancashire then you can take a cube from the Iron Demand track. This will cost an additional amount, as indicated. If there are no cubes left on the Iron Demand track then you can pay £5 to take one from the stock. After taking the cube place it back in the stock. If you take the last cube from an iron works then you flip the counter to its other side. The owner of the counter immediately moves his income marker a number of spaces along the Income Track equal to the value shown in the gold circle. You never have to pay another player to take iron from their counter. 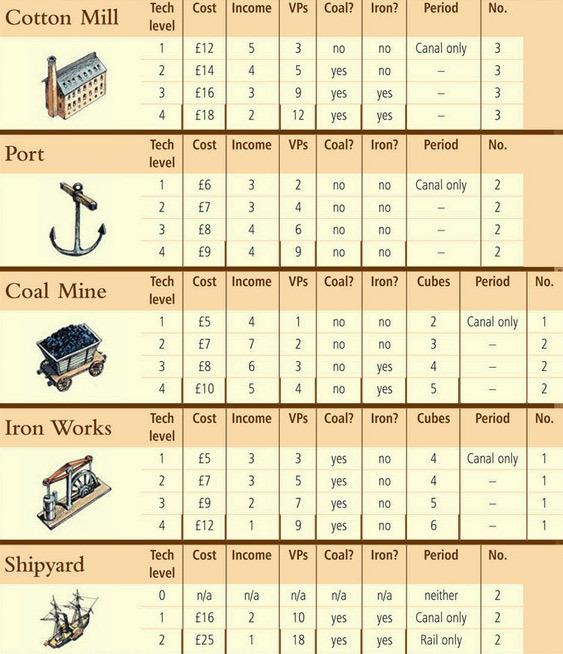 You must pay the full cost of the counter plus any additional amounts for coal and iron, as explained below. This money must be placed in your 'Amount Spent' box. There are a number of further restrictions on what you can build and where you can build it. You must always build the top Industry counter from one of your five stacks of counters. You cannot build an Industry with a Tech Level of zero. Any counter with a Canal symbol on it can only be built in the Canal Period, ie. you cannot build Tech Level 1 counters in the Rail Period. Any counter with a Rail symbol on it can only be built in the Rail Period. Each space in a location can only contain one counter. 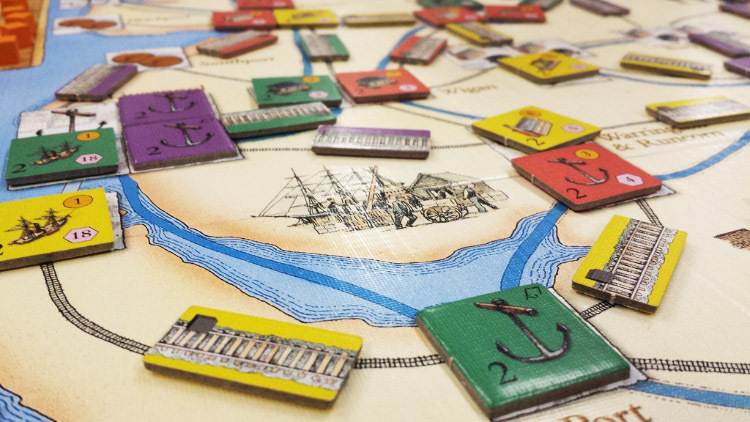 In the Canal Period each player can only have one Industry counter in a location. In the Rail Period the only limit to the number of counters you can have in a location is the number of eligible spaces available. When you build a counter you always place it face-up. Cotton mills produce textiles, which you can then sell via a port. Selling cotton is an action and results in the counter being flipped to its other side. Ports allow cotton mills to sell their produce. When a port is used to sell cotton it is flipped to its other side. You can also take coal from the Coal Demand track via a port. Coal mines are sources of coal cubes. When you build a coal mine you place a number of coal cubes on it, as indicated on the counter. A coal mine is flipped to its other side when all of the cubes on it have been removed. IMPORTANT: If at the point at which you build your mine it is connected to a constructed port then you MUST immediately move coal cubes from it to fill any empty spaces on the Coal Demand track. For each empty space you fill you take an amount from the bank equal to the amount shown to the left of the space. You fill the track from the bottom upwards. This money is taken after you have paid for building the coal mine, it cannot be used to pay for the coal mine. Note that if your coal mine is not connected to a constructed port when built but then becomes connected in a later turn you do NOT move cubes from it to the Coal Demand track. Iron works are a source of iron cubes. When you build an iron works then you place a number of iron cubes on it, as indicated on the counter. An iron works is flipped to its other side when all of the cubes on it have been removed. IMPORTANT: At the point at which you build an iron works you must move cubes from it to fill any empty spaces on the Iron Demand track. You do not need to be connected to a port to do so. You take an amount of money from the bank for each cube you place on the track, in the same way as coal. Shipyards have no special function, they are simply a good way to gain victory points. As soon as you build a shipyard you flip it to its other side. 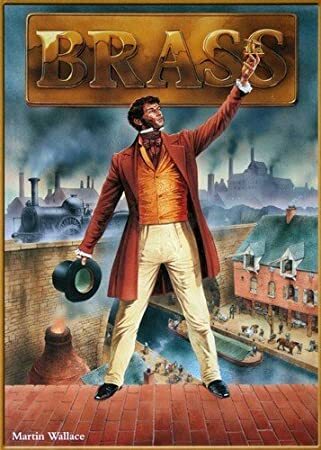 Note that in the Canal Period you will only be able to build a shipyard in Liverpool as Birkenhead and Barrow-in-Furness are only served by rail links. You can always build in a space already containing one of your counters as long as the new counter is of the same type and has a higher Tech Level. The old counter should be removed, along with any cubes on it. You can build on top of another player's coal mine with one of your own only if there are no coal cubes in Lancashire or on the Coal Demand track. Your coal mine must have a higher Tech Level then the one you are replacing. The above rule applies to iron works, you can replace one if there are no iron cubes left in Lancashire or on the Demand track. Income Levels are never reduced due to the removal of an Industry counter. You can combine your two actions into one action. In this single action you can build in any available space in Lancashire. You must still abide by all of the rules concerned with building an Industry counter. You must still play two cards. The particular card you played before selecting this action has no effect on where you can build a link. You can build a canal/rail link on any potential link that connects with one of your Industry counters or is connected to a location that you already have a canal/rail link running in to. Canals can only be built on potential canal links. In the Canal Period the only links you can build are canal links. Rails can only be built on potential rail links. In the Rail Period the only links you can build are rail links. Each rail link requires one coal cube, which must be moved to one of the two locations that the rail is being built between. As with building Industry counters this coal must be moved via rail links to its final destination, and must be taken from Lancashire first if possible. You can build a link from an External location that you are connected to. You can build two rail links in a single action. This costs £15. You still need one coal cube per link built. You can never build two canal links in a single action. The particular card you played before selecting this action has no effect on what development you can perform. As one action you can remove and discard one or two Industry counters from the top of your stacks. These can be from the same or different stacks. For each counter you remove you must also take one iron cube from the board. See the rules on Taking Iron to tell you where you can take cubes from. You can never add counters to a stack. The particular card you played before selecting this action has no effect on your ability to sell cotton. You may sell cotton from any number of your face-up mills. Each mill must sell to a face-up port or a Distant Market. Treat each mill you sell from separately. To sell to a face-up port your mill must be connected to it. Selling cotton to a face-up port flips both the mill and the port. You can sell your cotton to a port owned by another player, they cannot refuse you the use of it. You do not have to sell to the closest available port and you can trace a route through a face-up port to the one you wish to sell to. To sell to a Distant Market your mill must be connected to a constructed port. A single sale involves you turning over the top tile on the Distant Market stack and moving the Cotton Demand marker down a number of spaces on the track, as indicated on the tile. If the marker has not reached the bottom space then you can flip your cotton mill. You then earn an additional amount of money for the sale as indicated at the side of the track. You do this every time you sell to this market. Place the tile you remove at the bottom of the stack. If the Cotton Demand marker reaches the bottom space then you do not flip your mill. No more cotton can be sold to the Distant Market by ANY player for the rest of the period and all Distant Market tiles should be removed from the box. The particular card you played before selecting this action has no effect on how much money you can take as a loan. You may take a multiple of £10 from the bank, up to a maximum of £30. For each £10 you take you must move your wooden disc one Income band down the Income track. It is not possible to move below -£10. You cannot take a loan once the deck of cards has been exhausted in the Rail Period.